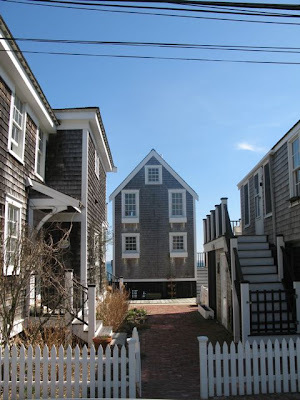 Before we head over to the museum, let's make a quick stop at 77 Commercial Street in Provincetown. Behind the crooked door of this old house was the summer home and studio of Ferol Sibley Warthen. 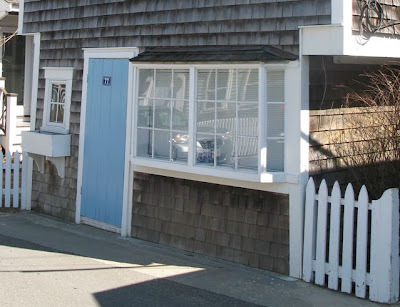 When I first moved to Boston, a friend of mine rented this oceanfront space for a few summers just after her death. I was lucky enough to visit often and learn about this amazingly talented artist. 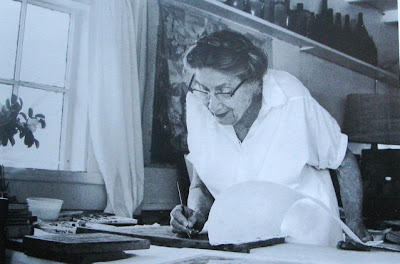 Here is a photo of Ferol Warthen in her studio working on a print. 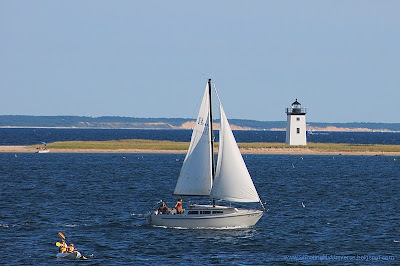 The Provincetown Print, also known as the White Line Print is a printing process that was invented in Provincetown. Unlike the Japanese printing method that required a different wood block for each color, this new method used one block with a tiny groove cut between each color to separate it from the next. After the wood block is cut, watercolor is painted onto a small section of the wood block at a time and the paper is lowered to transfer the wet paint onto the paper. Each groove cut into the block to keep the colors from running together leaves a white line on the print. The White Line print was born. The invention of the process is credited to B.J.O Nordfeldt around the time of WWI but it was developed by a small group of Provincetown artists and its most famous practitioner was Blanche Lazzell. 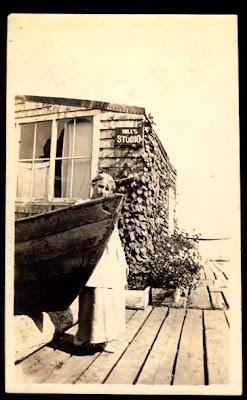 The photo below is Blanche outside of her waterfront studio. 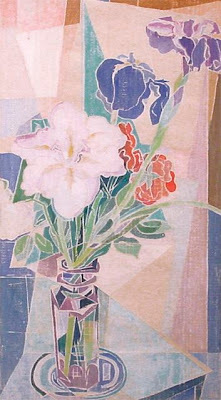 The image below is one of Blanche's White Line prints. 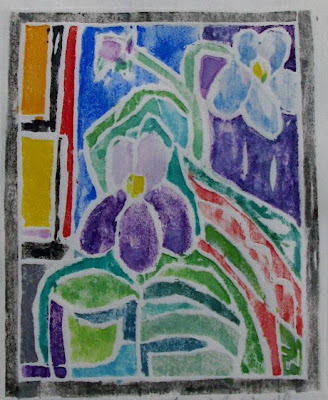 After a block is cut, it's possible to pull more prints from the same block and each time the block is printed, the artist can use different colors making each print an original piece of artwork. 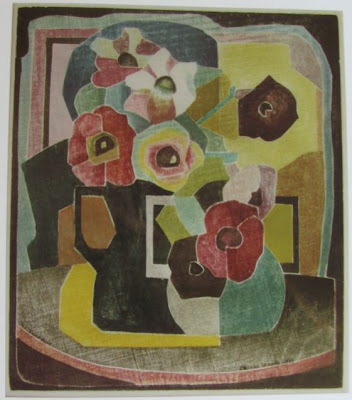 Blanche Lazzell pulled very few prints from her blocks so they are extremely rare and valuable today. Blanche Lazzell taught the White Line printing method to Ferol Warthen and in my opinion, Ferol became the master. Since the process requires painting a small section the block and transferring the paint while it is still wet, it's important not to have large open spaces in your design. The way Ferol Warthen divided the spaces in her designs in small sections is genius. Just look how the space around this beautiful Iris print is masterfully divided. 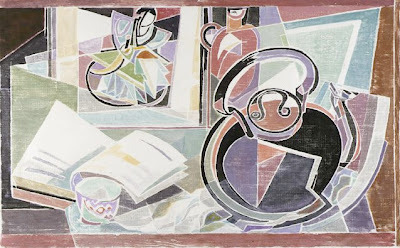 Warthen has used cubist techniques to create smaller areas that are both functional and in a way that is extremely pleasing. ...in this photo by Steve Borichevsky that is eerily similar that I found here. Just to the left of Ferol's studio is the narrow walkway to her back door that entered the kitchen that overlooked the harbor. Just ahead in the center of the photo is a cottage that sits on a wharf that extends into the harbor. 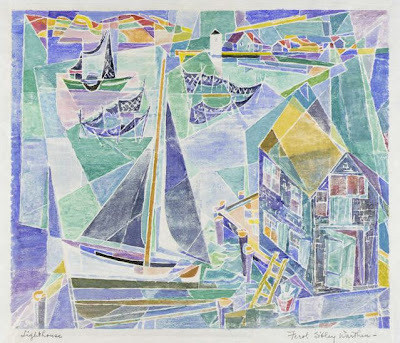 This wharf house appears in at least several Ferol Warthen works including this one entitled "Lighthouse" which I consider to be her masterpiece. This particular print is in the Smithsonian although there are several that exist. There are several white line artists working in Provincetown that are still carrying on the tradition. I believe the most talented is Kathryn Smith, the granddaughter of Ferol Warthen who learned the process from her grandmother as a child. 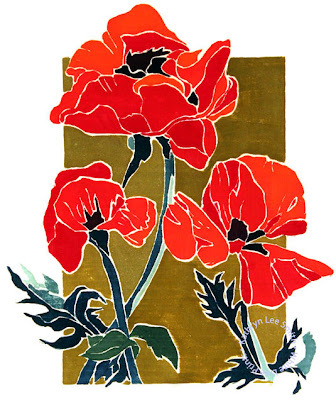 Here are few of Kathi's amazing poppy prints. Kathi's prints are the best being made today and are unique in their color saturation. There's no question that these prints are Provincetown's masterpieces of tomorrow. You can see more of Kathi Smith's work here. Today Kathi helps pass on this Provincetown invention by teaching workshops at the Provincetown Art Association and Museum. I had the pleasure of meeting Kathi a few years ago when I took her week-long class. 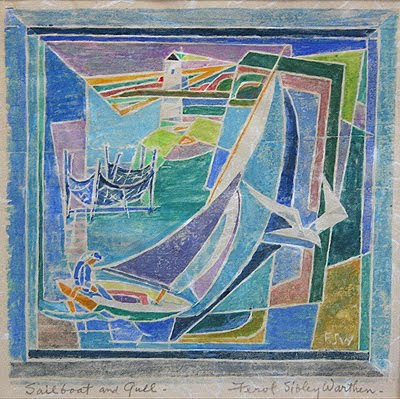 I regret that I never got to meet Ferol Warthen, but I'll cherish the time I was able to spend in her studio, seeing the sun rise over Provincetown Harbor and the Wood End lighthouse and I'm thrilled I was able to learn the process from her granddaughter. If you have any interest in going to Provincetown to learn the process, you can get more information here. thank you! I loved the explanation you gave. I love woodcut prints we have some amazing folk artists here in Brazil that do a great job, but they are generally black and white. Thanks so much for the wonderful art lesson! I would love to see how this is all done, I think you should share. I'd venture to say that once again you'll show us something special! 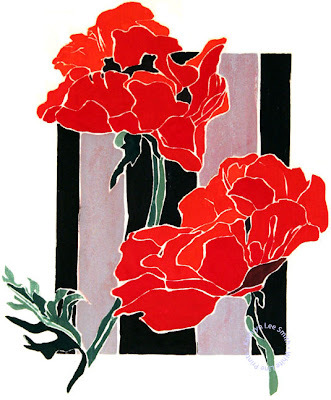 I loved all the prints, but that first Poppy print stole my heart! I'm away on little ski trip w/husband in Utah. I hijacked his computer to catch up on my fav blogs. I don't have much time now to read your last two posts which look fascinating. When I get back home I will read them in detail. 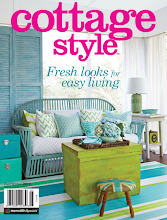 Can't wait to read about Cape Cod. p.s. I LOVE Mrs. Meyers too. Hey there. 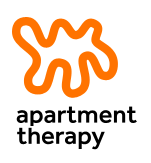 I just found your blog today and LOVE IT! Thanks for sharing and I can't wait to come back for more! Hi Steve, this is a fascinating post! I could have read on and on about this art. It's absolutely beautiful and I can see how you were so taken with it. It always seems like it's the small quaint towns that have the most intriguing stories, history and people. I was in Lancaster, PA this past week taking a tour of old Amish farmhouses and historical places - can you believe, I lost my camera!!! I was stuck in Chicago for two days trying to get back home and it mysteriously disappeared. I'm SICK about it. Cope Cod ... it's on my dream list. I envision it to be one of the most beautiful places. How's the living room coming along? Oh Steve, I just love the "Iris" painting. The way she did the cut glass on the vase is amazing! I have a painting i believe is a print. It is "Tabletop -1-". I have two prints - The Wharfhouse and the Lighthouse. Are they valuable?